Here’s a secret you don’t know about Cheepie–I love me an infographic. Combine infographic with grocery shopping, and I pretty much want this one in t-shirt form. It sums up some of the basic stuff about shopping that we all know (milk in the back of the store to make us walk past everything else) with some stuff that’s news to me, like bigger carts cause people to buy more. We’ve all got triggers that will have us buying things we don’t necessarily need. I’m a complete sucker for nearly anything with a 50% off sticker, for example. Knowing your own triggers, along with the science stores use to snag everyone, can help you save. We all like to do that! Thanks to a BestMarketingDegrees.Org for sharing this infographic. Monday’s Grocery Theory post here, sneaking in just over the wire. So far Grocery Theory posts have introduced a ranking of Austin grocery stores, methods of storing when stocking up, the types of shopping we do, meat, and weekly planning. You know what I’m talking about here. It’s that other number, usually on the shelf tag telling you how much your item will be. Many people never take a look at that other number, some people will look at it to compare if they are buying an item they’ve got zero brand loyalty to follow, and others, well, others are always looking at them and doing the math. It’s often surprising. In a perfect store, these numbers should help you comparison shop, by letting you know this toothpaste is $X per ounce, and that one is $Y per ounce (don’t worry, algebra haters, we’re not going to keep using numbers where letters should be!). Or say, eggs. Eggs should be easy. 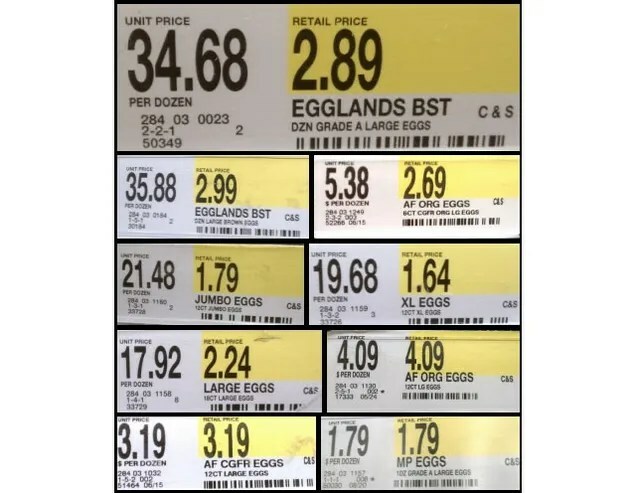 You’d like to know how much each egg is in the dozen you’re buying, compared to that dozen over there, or even compared to the 18-count over there. Heck, go crazy and compare it to that big 2 1/2 dozen thing people only buy at Easter, why not? It’s normal to expect the unit price to be per egg, and you’d have a second expectation of the price per egg being cheaper for the larger sizes. Expecting something and finding it aren’t the same. When is the last time you paid $34.69 for a dozen eggs? Yeah, me neither. This photo, taken by David S. Read and posted to his blog, is a great example of completely unhelpful, non-coherent unit pricing. You look at the first one, and you realize, someone multiplied the actual price of a dozen eggs by 12. That pattern works for a bit, ( with a hiccup for that 6-count at the top right, where they’re inexplicably multiplying by 2. because 6 is half a dozen?) but then there’s an 18 count egg carton, and they multiply that by 8 to get the unit price. NICE! But also deeply wrong. Then it ends with unit prices per dozen, which seems to be the what they can handle even if it’s not a useful unit tool, because they got all of those right. A dozen eggs cost as much as a dozen. That’s a safe bet. I saw this photo, and read his post, and was relieved. For years I’ve thought I was the only person looking at unit prices, and now I know I’m not alone. I thought I must be, because I’ve spent hours of my life in the toilet paper aisle (yes, this is a first-world problem I am having in the toilet paper AISLE. I have multiple stores with aisles of tush-wiping paper. I would be happier if there was one tp and I could just buy it and get on with my bad self! Or if we all agreed to use leaves), trying to figure out what to buy. At some point I’ll make a composite photo like the egg one, but toilet paper unit prices come in: sheets, sq. ft., sq. in., 1000 sheets, cm², and m². Have you ever stood there trying to figure out how many square feet per roll, so you could make an even comparison? I have, and it’s not simple. You’ve got to look at the size of the sheet, get the area, multiply that by the number of sheets, and multiply by that, and then convert sq. inches to to sq. ft. so you can compare it to cm² …yeah. That’s where even I stop and buy the one that seems cheapest per reasonably sized roll. I hate myself when I do that. But it’s not just eggs and toilet paper. I’m surprised all the time about the correct math that shows it’s cheaper to buy the smaller size of something rather than the larger (often, laundry detergent, soup, cereal), and by the wrong math demonstrated on the tags. Listen, if something that’s 8 ounces is 99¢, then it’s safe to say it’s not $1.89 per ounce. I feel like Common Core is trying to address this problem, with all of the estimates, and writing about how you got your answer. But honestly, if you as a shopper don’t see this, your shopping isn’t doing right by your grocery budget. Knowing how unit prices work is one of the great ways to save. The only thing that stops me from buying the cheapest thing per unit is brand loyalty, and I have very few of those (Hell-O Velveeta for queso!). Unit prices, when correct, can help you. I use them all the time, especially when buying cheese, canned goods, rice, and beans. You can too. You don’t need a calculator, just look. In most cases, they’re right. If something seems hinky–pull up the calculator on your smart phone and see if your intuition is right. That photo up there is an extravagant example of unit pricing being crazy. If you saw a sticker that said unit price was over $20 for a box of macaroni and cheese, you’d stop, right? In some terrible stores (HEB, you took unit prices OFF your eggs at Wm Cannon/S. 1st!) you don’t even have unit prices. Texas doesn’t require unit pricing, and just last week I noticed that they’ve been removed in some areas, prompting my post. Whenever you want to know the unit price? Look at what you’re buying. How much is it? Enter that into the calculator. Then, how big is it? This is the fiddly bit–if you are looking at a unit price, you want to match that, so if it’s per ounce (oz) that’s your number. Then you divide by that number. That’s your Unit Price, which is Dollars per Amount of Stuff. Comparing efficiently means matching units, so if you want to buy pasta, and you’re looking at different brands that are all 1lb each? Each one should have a label saying how much it costs, and also how much per lb. or per oz. If some are not labeled that way,but instead are ‘per serving’ or per 8 oz., that’s when you need to start getting cranky. Unit pricing is one of the best tools a grocery shopper has. If stores corrupt it, or don’t use it, it’s to the shoppers detriment. I encourage everyone to look at those unit prices. If the math doesn’t work, note it, and tell store management if possible. If there isn’t a unit price, and you want one, let them know that, too. Use your grocery dollars in the very best way you can! Monday’s Grocery Theory post here, sneaking in just over the wire. So far Grocery Theory posts have introduced a ranking of Austin grocery stores, methods of storing when stocking up, the types of shopping we do and weekly planning. This week I’ll be posting about meat. Chicken, fish, beef, lamb, mutton, offal, what have you, this week we’re just going to call it all ‘meat’. If you’re a vegetarian, this column will be useless to you, and all I can do is promise a similar discussion of vegetables sometime soon. Excepting beets, because holy cow those taste like dirt. I see two extremes in the purchase of meat. On one side, there is purchasing meat that was sustainably, organically raised by farmers who treat their animals humanely and respectfully. On the other end is purchasing meat that has been grown by a factory interested in maximizing a profit and that thinks of their product as a commodity. There is a lot of middle ground, grey area, labeling misconception, and governmental regulation in-between and around those two extremes. There is organic meat, natural meat, pesticide-free meat, local meat, solution-enhanced meat, free-range meat, grass-fed meat, organically fed meat, water-injected meat and probably a dozen more I haven’t listed. How to decide what to purchase, when you’ve got more options and price-points than a brain can hold? For produce, there’s the shortcut I try to follow, The Dirty Dozen, which you have likely read about. Meat doesn’t have any such clear-cut line, with the exception of the rule about big fish having more mercury than other fish, so it’s good to limit intake of tuna and other large fish. Other than that, we’re left floundering around (tip your waitresses, we’ll be here all week!). 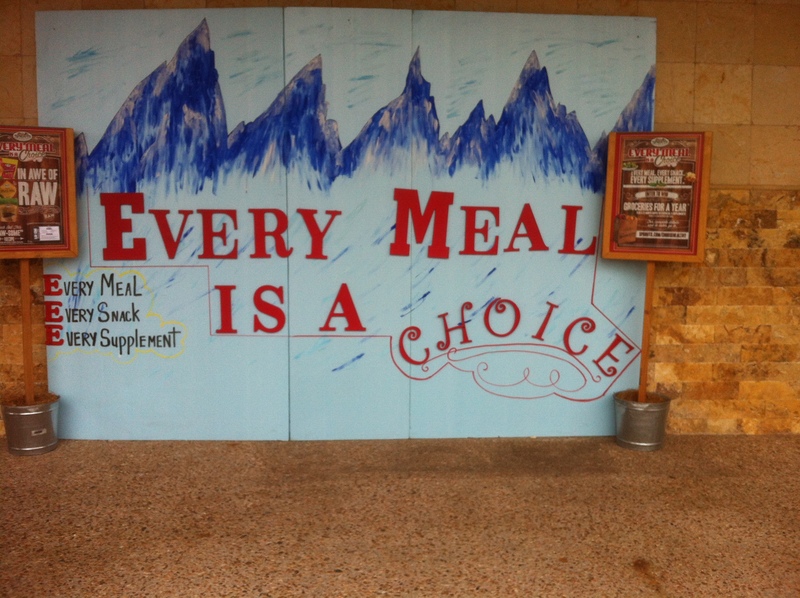 Large grocers aren’t likely to help us much, as this Washington Post article shows. To sum up: A grocery store chain decided to start labeling their meat ‘USDA Graded’. Which seems ok when it’s a nice shiny blue sticker, I guess. But read that sticker, and it means that the USDA graded it, that’s all. Doesn’t mean it’s Choice or Select, Prime or Dog Food, only that the USDA graded it. The USDA grades nearly all meat sold in the US, so that’s not really a useful label. Given the store ordinarily sold Select, and had previously labeled packages that way, there’s a conclusion to be drawn, and I leave that as an exercise for you, Dear Reader. Farmer’s Markets can help us a lot. You’re likely talking to a person integral to the care and butchering of the animal you’re taking home to eat, and like as not they’ll answer anything you want to know regarding the care and feeding of your meal-to be. We all know the problem here, though. Sing it with me, ~~~Meat for a week from HEB, I say!, at the price for just one day, at you, my lovely Farmer’s Market~~~. What, you didn’t know ~~~ meant sing? AND you don’t know that tune? I lament. Moving on. So, somewhere, we have to find a happy middle. One that won’t break the bank, ruin our karma, increase our pesticide load, and will taste good. Here’s how I break that down, to feel like I’m using our grocery dollars in the best way. Whenever possible, I do buy meat at the farmers market. My budget hasn’t held that room in a while, but I have still purchased ground meat or soup bones, which are usually the least expensive cuts. If you’ve got a family that will eat kidneys/liver, you can sometimes get a deal on those, too. If you have a CSA, I know several in town have a meat option, and I personally have bought 1/4 and 1/2 a cow before. Those were great options, but require investment (for a CSA an ongoing commitment). I never buy anything that’s been 12-15% ‘enhanced’ with a ‘solution’. If I want to brine something, I brine it at home, where I know what I’m doing. I don’t want to pay for water in my meat. Water is heavy and I’m paying by the pound. This is NEVER in big print on the package, and you need to look. If it seems like a cheap price, there’s often a solution involved. Even ‘Natural’ on the label doesn’t mean there isn’t an injected solution, just that the ingredients in the solution are natural. If certified organic meat is on sale to within a dollar or so of what I might usually pay, I consider it. Am I sure it will not end up leftovers? Can I freeze it and should stock up? If any kind of meat is on sale for less than $1 a lb? I’m considering buying it. Because I have freezer space and that’s cheap. At $2 a lb, I’m thinking about how much I use it, and how likely organic is to come close. Often, I stock up at this price as well. I thought I had something more complicated, but turns out, that’s it. Organic if it’s on enough of a sale, but really, other than that I shop the loss-leader meat. I try not to stress about pesticides, because in meat they mostly reside in the fat which is trimmed for most meals. Excepting bbq, and I’ll just have to ride that out, I guess. I don’t feel great about it, and wish it were different. Thinking about purchases is the first step though! What are your priorities in meat purchases? Do you only buy organic? 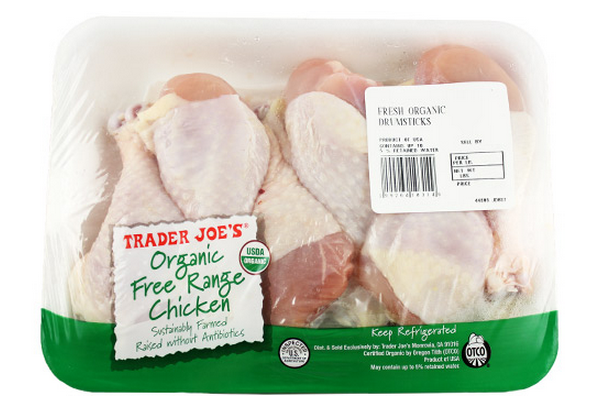 Where do you think the best organic prices are? The whole chickens at Sprouts were the cheapest I’d seen in a while, but I haven’t been watching closely until recently. Is there a Farmer’s Market or CSA that you think is well-priced? This is a clickable list defining terms you might find on labels of meat or produce. I found it interesting that all of these phrases: No Antibiotic Residues, Antibiotic Free, Drug Free, Chemical Free, No Antibiotic Growth Promotants are not allowed on meat products. Because I found it while researching this article here’s the link to the USDA grading rules. I find it interesting because I buy whole chickens often, but haven’t ever noticed the mark. Next time I’ll look. * In the event I next buy fish, I’ll buy a whole one and report. But if I buy anything at the fish counter, I usually buy shellfish, and my only rule there is it’s got to be from the USA. I’m not even sure why, but I must have read it somewhere. And now so have you, so you should do that too. And yes, for the purposes of this post, Boston is approximately Jersey. In our house, though, Wednesday was bowling night, which meant it was Fun Food Night, which meant pizza, sub sandwiches from the little shop, or McD’s/Burger King/Arthur Treacher’s. Beyond bowling night, I don’t remember any other schedule of meals. My mom will likely comment here, saying, “How can you not know that Monday was meatloaf? And Friday was fishsticks?” But I honestly don’t remember, while still knowing my mom’s meatloaf is still my favorite. I do remember dinner was every night at 6pm, which I cannot imagine pulling together. Mom, you rock! I recently borrowed a book from a friend called The Family Dinner. It’s written by Laurie David, and I was initially very skeptical of a book about family dinner being written by the wife of a famous funny guy who also has a full-time cook. As one is (hell-o Jennifer Seinfeld, putting spinach in brownies isn’t the same as healthy eating!). The whole book has a magazine feel to it, with many quotes from famous friends, and many, many text boxes saying fun things like, “Gardein, a new substitute for chicken, is made from soy, wheat, and peas and is a great source of protein.” Once I started though, I kept on reading, because she was addressing something I worry about. My house rarely eats dinner all at the same time, and if we do it’s still rarely together. This led me to the weekly meal plan. I figured if I had a plan, I could save the time spent wondering what to make, and put it toward yelling at the kids to wipe the paint off the table and get it set for dinner. This plan didn’t lead to 7 nights a week of family dinner, of course, and I can’t always stick to the plan. Having the general framework set up does help, though. I know that if I don’t have anything to put on a tortilla on Tuesday, I’ve got to shop or re-think. If there is a meeting Thursday night, I know the kids need healthy supplements to the box of mac and cheese Big Sister will make. Here’s my plan. First my basic framework for a dinner: each dinner has a protein, starch, fruit, raw vegetable, cooked vegetable. I try to make sure that there’s something each of us likes with each meal, but as the kids get older I worry less about this. I don’t list the entire meal, because it’s flexible, depending on what’s on sale. Monday and Thursday are the days I work on using leftovers. Refrigerator Buffet is simple–all the leftovers go out on the counter, and we fix plates. The kids love it, because they’ve got lots of choices, and I love it because it’s frugal and I don’t cook. Mondays are also a leftover day, but upcycled. I make fried rice with whatever meat and vegetables are left from a weekend of food, and use others to make a soup of some sort. If the leftovers don’t seem like they’ll be good that way, they go in a pot with beans and get served on rice. This way, I minimize waste as well as that urge to pick up take out! If you’ve got a plan, post it in the comments. Unless you have a monthly plan. Don’t type that in, just give us a link. You have things to do.